Applying photonic nanostructures to optoelectronics requires characterizing precisely the emission and propagation of light inside these structures. The group « Nanophotonics and quantum optics » at INSPS has studied photonic structures by combining spatial and angular analysis of their radiation. It could then be shown that different points on the same nanostructure emit light into different directions, in relation with the electromagnetic field distribution inside this structure. 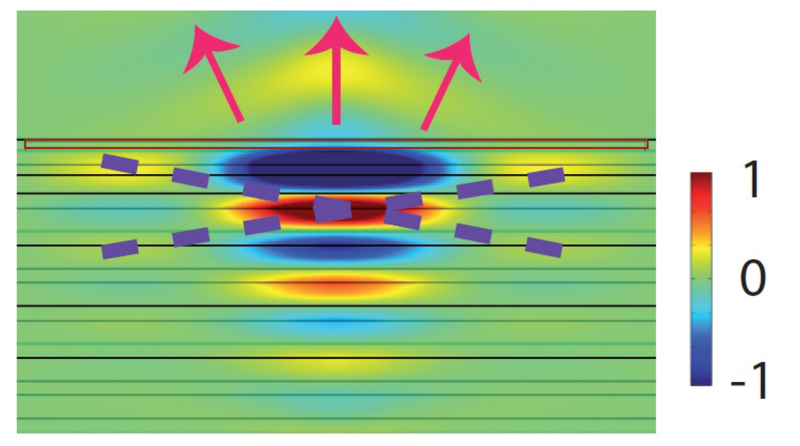 The photonic nanostructures under study consisted of a Bragg mirror (periodic stacking of dielectric layers showing strong reflection due to constructive interferences, fabricated as part of a collaboration with the LPN in Marcoussis) covered by a metallic disk (with strong reflection ; fig. 1a). 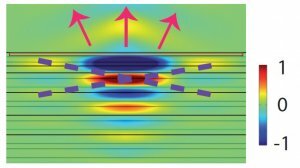 Light can then be confined at the interface between the Bragg mirror and the metallic mirror : these electromagnetic modes, called « optical Tamm states », allow for a versatile control of light confinement ; applications for nanolaser fabrication or optimized single-photon sources have been demonstrated. By inserting fluorescent emitters (CdSe/CdS nanocrystals provided by the ESPCI in Paris) inside a Tamm-mode structure, these Tamm states can be excited and their radiation can be studied by microscopy. The angular radiation distribution is measured by placing a camera in the image focal plane of the microscope objective. By selecting moreover the emission originating from a given portion (of diameter 1.5 µm) of the metallic disk (fig. 1a), we could perform a characterization of the radiation with spatial and angular resolution. Figure 1(b) shows the radiation angular distribution at three different points of a 10-µm Tamm-modes disk. Let us note a difficulty intrinsic to this measurement : as the electromagnetic field spatial and angular distributions are congugates (Fourier transform of each other), they cannot be know simultaneously with unlimited precision – in other words, spatial selection of a portion of the disk leads to diffraction of the emission which broadens its angular distribution. (a)	Schematic of the optical Tamm modes nanostructure and the measurement which was performed. (b)	Radiation angular distribution of a Tamm-modes 10-µm disk considered at 3 different positions on the disk : experimental measurements and 2D finite-elements simulations. Figure 1(b) clearly shows that different points of the Tamm-modes disk radiate into different directions ; the left portion of the disk radiates to the left, while the right portion radiates to the right. This behavior can be explained by considering the electric field distribution inside the structure (2D finite elements simulation, fig. 2) : the field radiated upwards presents wavefronts oriented to the right for the right part of the figure and to the left for the left part of the figure (propagation direction indicated by pink arrows). This radiation shape reflects the electric field distribution inside the structure : the wavefronts of the radiated propagative field follow the direction of alignment (purple dotted lines) of the lobes of the field confined inside the structure. The theoretical radiation patterns are in qualitative agreement with experimental results (fig. 1b), confirming the relevance of these measurements. Electric field distribution of the Tamm-modes nanostructure (zone dimensions 2x 10 µm²). Combining spatial and angular analyses thus provides access to supplementary information on the radiation of photonic nanostructures. Ongoing measurements about Tamm-modes structures show, moreover, that the overall direction of emission depends on the position of the fluorescent emitter inside the structure : controlling the position of a single emitter below the disk would then provide a mean to tune the direction of its light radiation. .